Pradera residents are set for a winter full of sledding, with access to great parks in both Parker and Castle Rock. Here are some tips for parents to keep all the kids safe when you take part in the slipping and sliding. Have fun out there! Stay Warm. Bundle up not only for temperature control, but to help provide padding for your body. Warm layers will make the bumping and sliding more comfortable. Wear a Helmet. Protect that noggin! Added bonus: keep your ears warm. Check out the End First. Where does the sledding trail end? Make sure that the bottom of the hill is not near roads, biking trails, or busy pedestrian areas. Maintain Control. Pick a sled that is appropriate for the sledders height and weight. Also, make sure they know how to steer! Do not use items that you cannot control, such as lunch trays or trash can lids. Watch Out. As you hike up the hill, or hang out at the bottom, watch out for sledders! 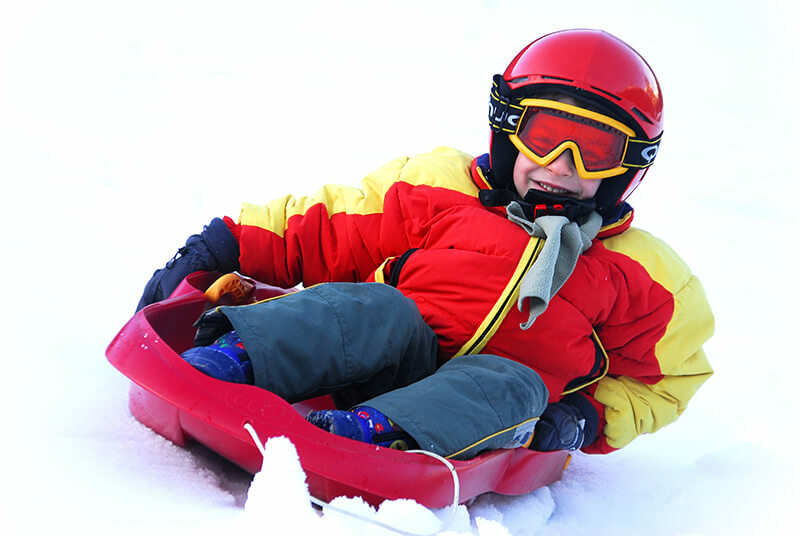 Before you sled downhill, look out for other people, for other children, and for any objects or debris in the path. One at a Time. For optimal safety—and opportunities to laugh at yourselves—sled down the hill one at a time. This way you won’t bump and jostle each other, or innocent bystanders. Remember to bring along your gear, such as sunglasses and your cell phone, just in case (does anyone actually go anywhere without a cell phone anymore?). Load up on snacks and warm drinks to enjoy when you take breaks! Pradera residents enjoy a wide variety of family and community activities all year long. Our community amenities simply can’t be beat, and offer something for everyone in the family. We take full advantage of beautiful Colorado winters here at Pradera.